SCVHistory.com | St. Francis Dam | Los Angeles Examiner, 3-17-1928. Los Angeles, California | Saturday, March 17, 1928. The St. Francis Dam collapsed at 11:57 1/2 pm on March 12, 1928. As such, due to reporting deadlines, the first reports of the disaster appeared in most evening newspaper editions in Los Angeles and elsewhere in the country on March 13. Therefore, this March 17, 1928 edition of the Los Angeles Examiner represents the fifth day of reporting on the dam disaster. 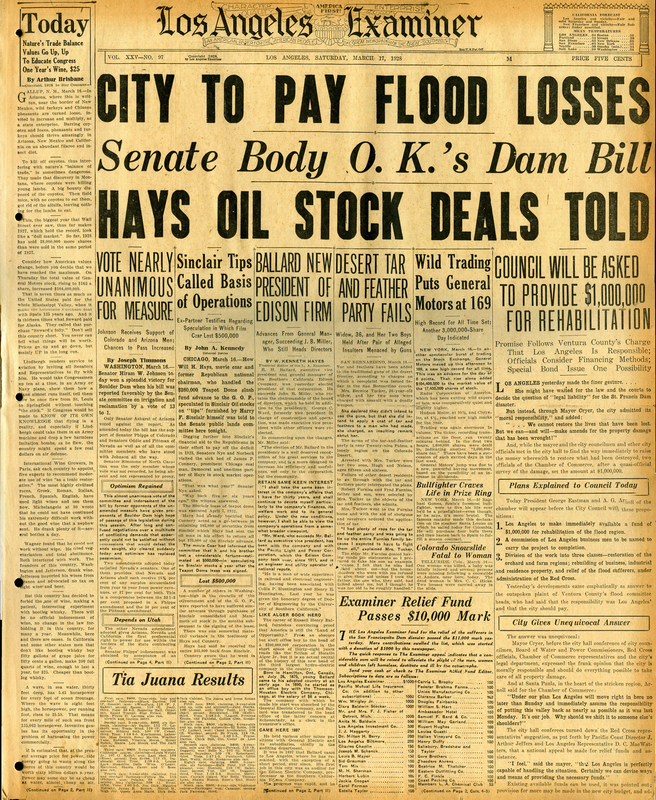 There were multiple editions of the newspaper published on March 17, each with variations of different headlines regarding the City of Los Angeles' agreement to pay for all flood losses.